다니엘 셀을 닮은 화하가 전지 구성. 화학 전지(化學電池, electrochemical cell)는 화학 반응을 통해 전기 에너지를 발생시키거나 전기 에너지를 사용하여 화학 반응을 일으키는 장치이다. 전류를 발생시키는 화학 전지는 갈바니 전지라고 하며 이를테면 전기 분해를 통해 화학 반응을 일으키는 전지는 전해 전지라고 부른다. 널리 사용되는 갈바니 전지는 표준 1.5 볼트이다. ↑ “Electrolytic Cells”. 《hyperphysics.phy-astr.gsu.edu》. 2018년 5월 17일에 확인함. ↑ “Electrochemical Cells”. 《hyperphysics.phy-astr.gsu.edu》. 2018년 5월 17일에 확인함. Electrochemical cells which generate an electric current are called voltaic cells or galvanic cells, and common batteries consist of one or more such cells. 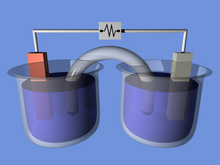 In other electrochemical cells an externally supplied electric current is used to drive a chemical reaction which would not occur spontaneously. Such cells are called electrolytic cells. ↑ “Byjus ( a tutorial site)”. 이 문서는 2019년 2월 25일 (월) 22:57에 마지막으로 편집되었습니다.